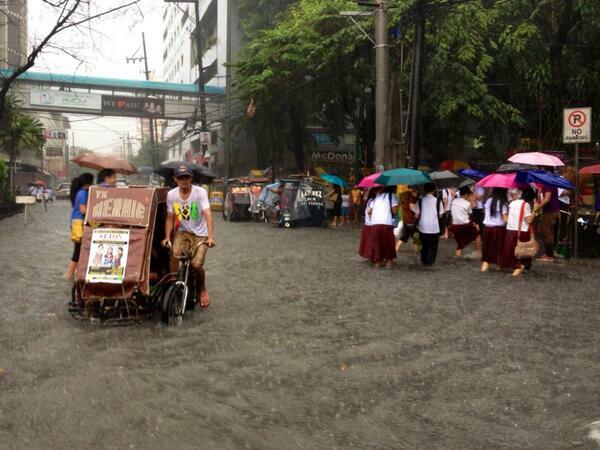 Manila, Philippines - Classes in the University Belt in Manila and other cities has been suspended Thursday afternoon, June 13, 2013 due to heavy rains that caused knee-deep flooding. Department of Education (DepEd) advised netizens to use #walangpasok hashtag on the popular microblogging site Twitter for the announcement of class suspensions. Monitor #walangpasok for announcements of class suspensions. Stay safe everyone! Effective 3:00 pm, Manila Mayor Alfredo Lim suspended classes in all public schools, both elementary and high school. PAGASA said that the situation is triggered by enhanced southwest monsoon (Habagat). As of 5pm bulletin, the weather bureau said that Metro Manila, Ilocos Region, Central Luzon, MIMAROPA and the provinces of Cavite and Batangas will experience cloudy skies with moderate to ocassionally heavy rainshowers and thunderstorms which may trigger flashfloods and landslides. The rest of the country will have cloudy skies with light to moderate rainshowers and thunderstorms. Espana Boulevard and Taft Avenue area were flooded with ankle- to knee-deep waters due to continuous heavy rains, Metropolitan Manila Development Authority (MMDA) reported on Thursday.